Fix That Front Tooth at Sugar Fix! 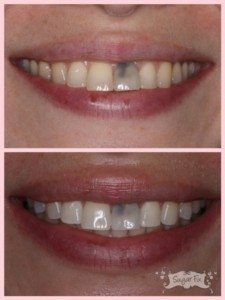 It is very common in dentistry for us to have consultations on single tooth crowns or veneers. There comes a time when you need to fix that front tooth, and the place to do it is at Sugar Fix Dental Loft with Dr. Emery! Chipped/worn front tooth to be fixed! Usually, if front teeth get hit accidently with a football, elbow, or any type of trauma, it can cause discoloration. If a root canal treatment is needed, a crown is placed to strengthen the tooth and for esthetic reasons. Below is a patient who is going to have a crown placed on her discolored tooth. A root canal was done several years ago, and the tooth has discolored more and more over time. We did a whitening first to take away any staining to match her pretty new crown. She’s excited for her visit with us next week! Another situation you can fix esthetically sometimes with front teeth is the example shown below. The patient did not want to do Invisalign to correct the tooth, so we are able to prep it for a crown to change the esthetics of just the one tooth that bothers her. 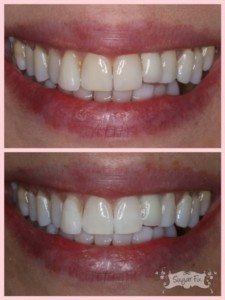 We, also, completed an in-office whitening treatment first so we can match her bright white smile! Esthetic correction with crown to be done soon! In all situations, Zoom bleaching trays are made afterwards to maintain their pearly white smiles! Stay tuned next week for the gorgeous temporaries on all of these “onesie” cases! !